Kish International Airport (IATA: KIH, ICAO: OIBK) (Persian: فرودگاه بین المللی کیش‎) is an international airport on Kish Island, Iran. The Kish International Airport serves as the entry point for the hundreds of thousands of tourists who come to Kish Island. The airport grants 14-day visa-free entry foreign citizens who enter from a foreign country under a different scheme from that of mainland Iran. Prior to the Iranian Revolution, Iran had an outstanding order for two Concorde aircraft. These aircraft were supposed to be used on Kish-Paris and Kish-London routes to serve the luxury tourism market that Kish was supposed to serve. The airport had been designed to handle Concorde's landings and take-offs. In the 1980s, the Kish Free Zone Organisation (KFZO) was created. It offered visa-free travels to the islands for foreigners, and 15-year tax exemptions to foreign investors. The plan was to compete with Dubai's attractiveness for international business. The plan failed as the airport was mainly served by Iranian airlines. It became mainly used by Iranians coming to enjoy the looser rules of the island. In 1998, the 11-month construction of Terminal 5 started, covering a 5,500 square meters area, with a budget of RIs 2,245 million financed by the Organization of Kish Free Trade Zone (FTZ). In 2015, under the leadership of the Organization of Kish Free Trade Zone (FTZ), a new terminal is planned for construction. The new terminal would turn Kish International Airport into the 2nd largest airport of the country with a 4.5 million passengers capacity per year. 2.7 million passengers travelled through the airport that year. The Kish International Aiprort is the main host of the Iran Kish Air Show, the aviation airshow held biennially. ^ a b c "Kish finds its niche". Arabianaerospace.aero. 19 October 2016. Retrieved 20 July 2017. ^ "Construction of 5th Terminal of Kish Airport Starts". Tehrantimes.com. 9 November 1998. Retrieved 20 July 2017. ^ "Iran To Turn Kish Island In Persian Gulf Into Key Aviation Hub". Payvand.com. 14 September 2015. Retrieved 20 July 2017. 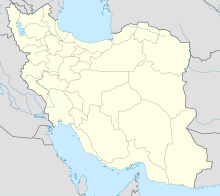 This Hormozgan province location article is a stub. You can help Wikipedia by expanding it. This page was last edited on 24 March 2019, at 07:53 (UTC).